Bond Economics: "Fed To Hike Rates By Mid-Year": Yeah, But Which Year? "Fed To Hike Rates By Mid-Year": Yeah, But Which Year? The Employment Situation Report for March was at best mediocre. 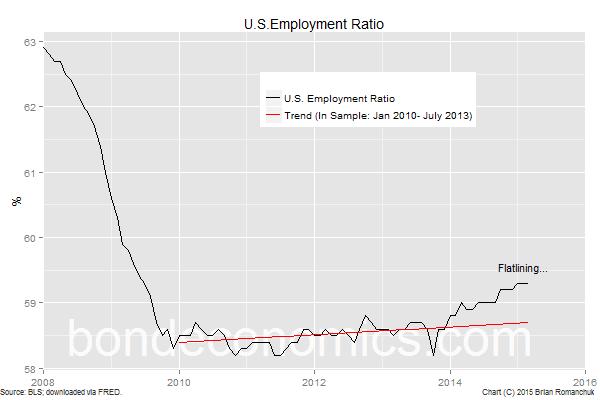 The Unemployment Rate and the Employment Ratio (pictured above) were unchanged. My "base case view" at the beginning of the year matched the consensus view, in that rate hikes by "mid-year" was the most likely outcome. However, the risks were skewed towards further delays, and this labour report pushes in that direction. Although there are demographic issues, my feeling is that the Employment Ratio is the best measure of how the labour market is doing. The Unemployment Rate is flattered by the falling Participation Rate. Although various economy bulls have been trying to paint the falling Participation Rate as a demographic story, I argue that the falling Participation Rate is due to lack of jobs, not retirement (link). Although the labour force is increasingly weighted towards low-participation rate seniors, the population was not hit with an "ageing ray" in 2008. The labour market is slowly tightening, but the percentage of the working age population that is actually working has barely budged in over six months. There is very little sign of an acceleration in growth. As for the Nonfarm Payrolls (NFP) report, in addition to being mediocre (+126 thousand jobs in March), 69 thousand previously reported jobs in January and February were revised away. The previously strong job creation trend in Payrolls has now been revised down to average +197 thousand per month in the 3 months of 2015, well below the average over the last 12 months (+269 thousand per month). Why people attach so much importance to the NFP monthly numbers remains an ongoing mystery, as whatever trend that exists can get revised away. I'll take the randomly distributed errors of the Household Survey over systematic errors any day. There are still a couple more labour reports ahead of the June FOMC. Therefore, things could turn around before then. Policymakers would love to be able to say that the economy has "normalised", which is why I have had somewhat of a hawkish tinge to my analysis. (I personally see no reason to hike rates this year.) But given the ongoing agony of the euro area, delay seems to be in the air. Interesting article; I will have to think about the logic. Thanks for the heads up. I am deeply in the middle of another article, which is partially in response to some comments by Brad DeLong.